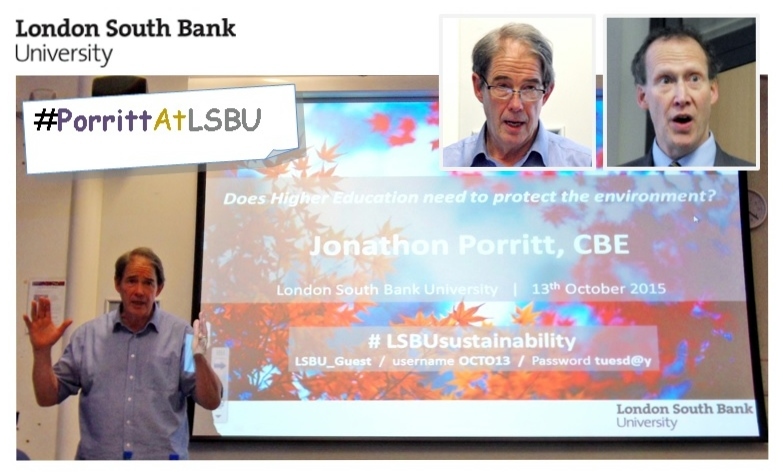 Universities have a binding, moral obligation to ensure that their graduates not only understand the dynamics of climate change but also are capable of dealing with its challenges, said eminent environmentalist and writer Jonathon Porritt CBE at an event on 13 October 2015 hosted by London South Bank University (LSBU). The event, titled ‘Higher Education No Longer Needs to Protect the Environment’, started with an introduction by Professor Patrick Bailey, Deputy Vice Chancellor LSBU. Jonathon Porritt started with a spiritual tone, referring to recent Pope Francis statement on the importance of nature. Before moving to sustainability in higher education, he talked about a range of environmental and sustainability issues in the wider world. His commentary was followed by a Q&A session, run by Professor Bailey and Andrea Smith, Ethical and Environmental Officer of the student union. The evening of discussion came to an end with a networking session with refreshments. The write-up below has been crafted using what Jonathon Porritt and Professor Bailey said in the event. Jonathon Porritt is Co-Founder of Forum for the Future, Chancellor of Keele University, former Chairman of the UK Sustainable Development Commission and former Director of Friends of the Earth. Before joining LSBU as Deputy Vice-Chancellor, Professor Patrick Bailey was Pro Vice Chancellor Environment and Sustainability at Keele University and received the Leadership Award in Green Gown Awards 2014. Over the last several decades, the environment agenda has moved from a minority fringe to a majority viewpoint. However, what we can see today is all key global environmental indicators going in the wrong direction. Moreover, climate change, which is the most formidable challenge, overshadows other critical environmental issues, such as air pollution and ocean acidification. A reason for our failure in the environmental front is how we see nature. Nature has intrinsic rights regardless of its value to human beings but we continue to look at it through a utilitarian lens. We in the West don’t usually ask deep, philosophical questions about nature but non-western cultures, particularly indigenous communities, have developed a deeper understanding of the human-nature relationship over generations. For example, drawing from his cultural thought, Bolivian president has called for an International Court of Climate Justice and Mother Earth in the run up to the Conference of Parties (COP21) in Paris later this year. Another reason for our failure is that no one in the UK knows how to do politics without economic growth; even Green Party is struggling here. However, there are rays of hope, at least outside the UK. For instance, we can see an incredible surge of renewable innovation around the world, especially in Africa, South America, the Middle East and South Asia. This renewable energy revolution is unstoppable although unfortunately Britain seems to be heading backwards. Moreover, we can be somewhat optimistic about COP21 Paris, particularly because two big players – the US and China – are stitching things up for good. Turning to sustainability in higher education, universities have a binding, moral obligation to ensure that their graduates understand climate change and that they are capable of dealing with its challenges. How are UK universities doing? Most are doing well in Estates and in their respective local communities. However, their performance is not equally satisfactory in their core business, i.e. Teaching and Research. One reason is that universities are odd organisms. In a company, when CEO embraces sustainability, he or she can use their influence to get all aboard. In a university, however, although the vice chancellor looks equivalent to the CEO in a company, he or she would not be able to use the normal levers to drive the sustainability agenda in their institution. In universities, the command and control approach simply would not work and innovation is the way forward. What can universities do? There are many opportunities to engage the university community with sustainability, particularly students. For instance, induction can be used to engage the news students with the environment agenda. Another is getting students excited about green innovation. However, universities should first act as good examples. That’s why divestment (i.e. getting investment out of fossil fuels) is so important. Stepping beyond that, as the National Union of Students (NUS) advocates, what should follow divestment is socially responsible investment in, say renewable energy. Here, a wonderful motivator for universities is RE100, which is a global initiative that engages, supports and showcases influential companies committed to using 100% renewable power. In short, divest from bad stuff and invest in good stuff. Having started at LSBU last year, I am initially engaged in somewhat ‘superficial’ projects, still signposting the way. Those who come to our university should get a sense that we are taking care of what is around us. On making a university more sustainable, my advice is, start doing things that are relevant to different parts of the university instead of going for one big drive for making the university more sustainable. Three to four projects a year would be good. Embedding sustainability in the curriculum is much more challenging but is possible because sustainability can be built into any subject. However, it is a long term project. A university is a community, mainly comprising students and staff. So our students are not our customers. Finding the right ways to engage the student body with sustainability is critical for making a university more sustainable. Note: Photographs by Asitha Jayawardena. An event, titled ‘Global Energy, Global Climate’, will take place at University College London (UCL) on 20 October 2015 from 18:30 to 21:00. This event, supported by UCL Grand Challenges programme, is hosted by UCL Energy Institute, UCL Institute for Sustainable Resources, UK Energy Research Centre (UKERC) and the Embassy of France in the UK under the auspices of the long-established relationship between the Embassy’s Science and Technology Department and UCL Grand Challenges. This is the first in a series of three events planned for the 2015-16 academic year. The event will see the launch of the book Global Energy: Issues, Potentials, and Policy Implications, which is the outcome of UKERC’s second phase of work. In this event chaired by The Guardian’s Environment Correspondent Fiona Harvey, a panel of internationally recognised speakers will review the global energy scene and the challenges posed by the need for secure, affordable and environmentally sustainable energy, and will discuss the energy and climate solutions in the context of the evidence laid out in the book. A short networking and drinks reception will follow the talk. The event is open for the UK and French research community, students and members of the general public. However, prior registration for a FREE ticket is essential. 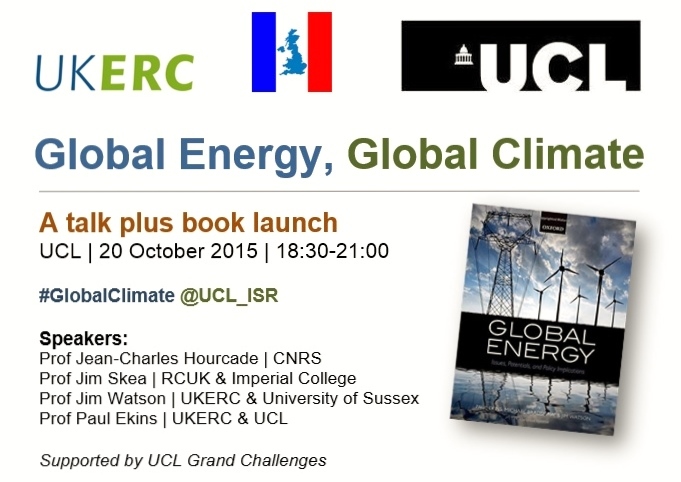 The event can also be followed on twitter using #GlobalClimate @UCL_ISR. Note: UCL logo is from the UCL website; France-in-the-UK logo is from the website of the Embassy of France in the UK; UKERC logo is the from the UKERC website; image of the book cover is from the book’s page on Amazon.